The nucleus of the Library’s collection was formed in 1898 and the Library has occupied two different buildings: the Registry known now as the Old Administration Building at the St. Augustine Campus and the building at its present location on the JFK quadrangle which was completed with funds provided by the United States Government in 1969. The Library has been known as the John F. Kennedy Library, The Main Library and was officially renamed The Alma Jordan on February 28th 2011. During the course of the celebrations to mark the fiftieth anniversary of the St. Augustine Campus of The UWI in 2010, it was decided to name certain buildings in recognition of staff members who made outstanding contributions to the development of the campus. Seven buildings were renamed and one of them being the Main Library in recognition of Dr Alma Jordan, who was Campus Librarian at The Main Library from 1960 to 1989, serving also as University Librarian from 1982 to her retirement in 1989. The Library continues the tradition of service first offered from the landmark Administration Building. The Republic Bank Library and Information Resource Centre, located at the Arthur Lok Jack Global School of Business, Max Richards Drive, Uriah Butler Highway North West, Mt. Hope, Trinidad, West Indies was opened to students on the 12th September 2005. The Library prides itself in the provision of a quiet, clean and comfortable place for reading, research and learning. The Library houses over 1000 books and reference material including Practicum, CD’s and Journals. The Library provides access to over 20000 scholarly articles via the online databases. All registered students are encouraged to visit the Library and make use of its resources. The Norman Girvan Library is located on the upper level of The Institute of International Relations at The University of the West Indies, St. Augustine Campus and houses a specialized collection of over 23,000 monographs and 240 journal titles. Particular emphasis is placed on material concerning the Caribbean and Latin American areas. Specialised Subject Areas consist of International Organisations; International Politics; International Trade; International Law; Diplomacy; International Relations Theory; International Money & Finance; International Relations of the Caribbean; International Relations of Latin America. Only registered Students and Staff of the Institute are allowed borrowing privileges. The Medical Sciences Library is located centrally in the Faculty of Medical Sciences, The University of the West Indies at the Eric Williams Medical Sciences Complex, Champs Fleurs, Trinidad and Tobago. The Library has a total floor area of 3,000 square metres, located on one level, with seating for 270. Special facilities include 4 seminar rooms as well as an audio-visual group-viewing room, each with seating for twenty-five (25) persons. There is also a Training Room equipped to facilitate activities related to the Library’s Information Literacy Programme. The Library’s stock consists of34,850 books, 536 current journal and 2 newspaper subscriptions, 6,900 bound serial volumes, electronic resources, over 1,100 multimedia items. The collection is classified according to the US National Library Medicine Classification (NLM) scheme. There are 2 special collections: (1) West Indian Medical Collection; (2) PAHO Collection. The School of Education Library is located off Circular Road in St. Augustine. The general collection contains approximately 40,000 volumes covering subjects such as: Assessment, Curriculum Planning and Development, Early Childhood Education, Educational Administration, Educational Psychology, Educational Research, Educational Technology, Guidance and Counselling, Health and Family Life Education, Human Resource Management, Language and Linguistics, Mathematics, Measurement and Evaluation, Nursing Research and Administration, Philosophy of Education, Reading, Social Studies, Sociology of Education, Special Education, and Teacher Education and there are over 275 journal titles and many online journals. The Patience-Theunissen Memorial Library's collection focuses on: The Bible, Christian Theology, Christian Ethics, Christian Spirituality, Christian Pastoral Care, Christian Education, Christian Liturgy & Worship, Christian Ecumenism, Church History, Canon Law, Philosophy, World Religions, Inter-Religious Dialogue. Only Theology Students that are registered through the Seminary school or through the UWI School of Continuing Studies (SCS) can borrow books. For everyone else the library is available as a Reference Library only. Library loans are not allowed. 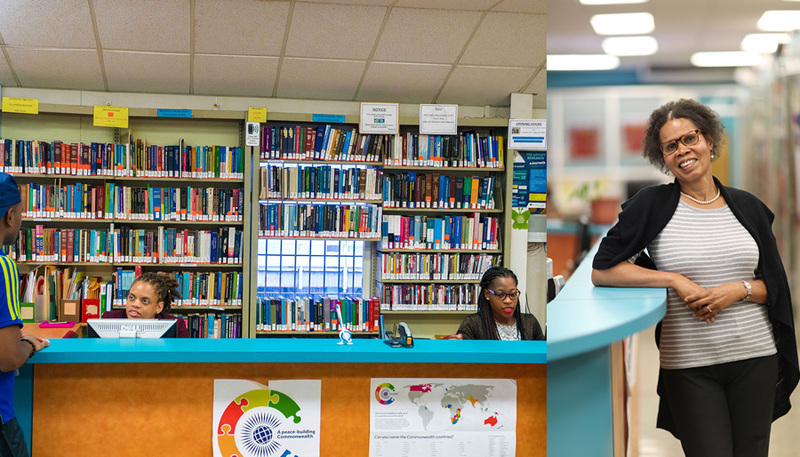 This Library possesses a substantial collection of A'level, Pre-Health, Early Childhood, West Indian Collection, Substance Abuse, Social Work, and Psychology literature. The Campus Libraries. All Rights Reserved.